Hi, my name is Kathy...and I'm a Needle Artist. My love is anything stitched...quilts, crazy quilts, crochet, cross-stitch, beads, embroidery,...you get the idea I'm sure. If this is your first visit, it is probably because of OWOH 2011...and if not, read on and I'll tell you all about it...and give away a gorgeous Swarvoski perle and crystal necklace that I created. 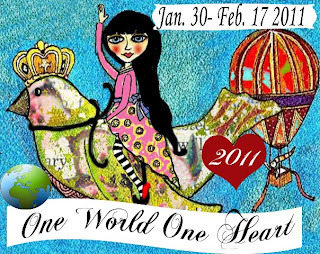 I am proud to participate in the 2011 One World One Heart Event!! One World One Heart is a worldwide event for bloggers only. It gives all those who blog a chance to meet and mingle and form connections with those they may not have otherwise met from all over the world. In the past 4 years this event has grown to over 1,000 participants with lasting friendships (and even one love connection) formed along the way. 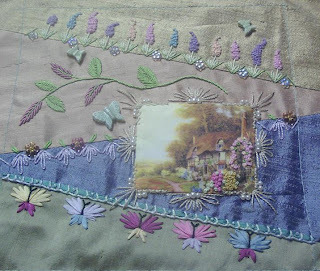 Think of it as a GIGANTIC open house allowing you to travel without ever leaving your home........going from blog to blog(in various countries) seeing the wonder each one has created and meeting all the fabulous people behind those blogs. As a bonus each blogger participant will offer up a "door prize or prizes"....just for dropping by, saying hello and seeing their world. It's really that easy. And here is our door prize at Shawkl!!! A stunningly gorgeous pearl and crystal necklace! 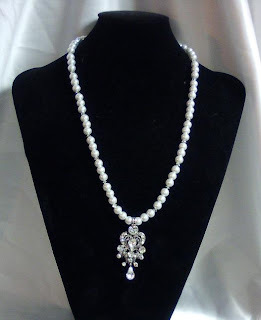 The pendant is a vintage drop, and is spectacular! 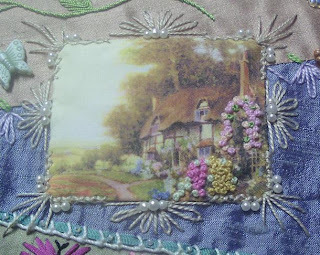 My blog reflects my current passion for beading in jewelry and in crazy quilt embellishments...and my constant needle-art adventures.While you are here...look around...I post a lot! 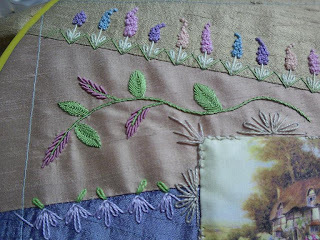 And many of those posts are of the How-to nature...in some type of stitching or beading. So, hope you enjoy your visit! THEN, leave a comment to this post so you will be entered in the drawing!...and at the end of the event (Feb.17) I will choose the winner of my necklace by use of a random number generator. The winner will be announced on my blog on the 18th of February...and I will attempt to email the person or persons to let them know they have won (so make sure your profile is up to date so your email is accessible)...I will also ask for a mailing address in that winner email. All bloggers are eligible...this is open internationally!! The door prize will be mailed out within 3 days AFTER the event ends. So, happy One World One Heart!!! We have a WINNER...Congrats to Naomi of Beeshebags! And she has replied to her notice email and I'll be sending the necklace off to Australia! For those that did not win...and I'm sorry (I didn't win anything this year either)...but stick around, my daughter's birthday is the 4th of March...and I'll be having a give-a-way to celebrate! So check back then! 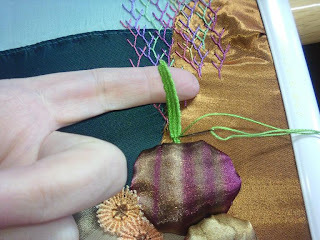 This stitch continues the herringbone base stitch...and is simple to execute. The templates help keep the stitch base straight and neat...although, I'm sure some of ya'll are much better at embroidery than me...and could do this without the templates. 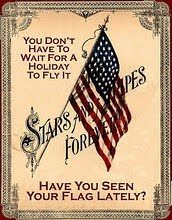 Perhaps, one day...I can too...but right now, they help me out immensely. If you want to see where I started...check out the tags for BJP2011 in the sidebar. 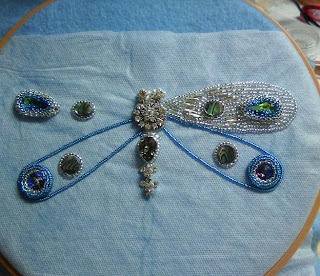 There is still a lot of beading to do in the wings...and I don't have an idea on completing the blue wings yet...but, it will come...all in due time says my muse! Here's a close up for you...isn't the "bling factor" great with this! and the leaves are velvet leaves from a little bunch of silk flowers. I stripped them from their wire stems and stitched them down by a simple back-stitch in the shape of veins. 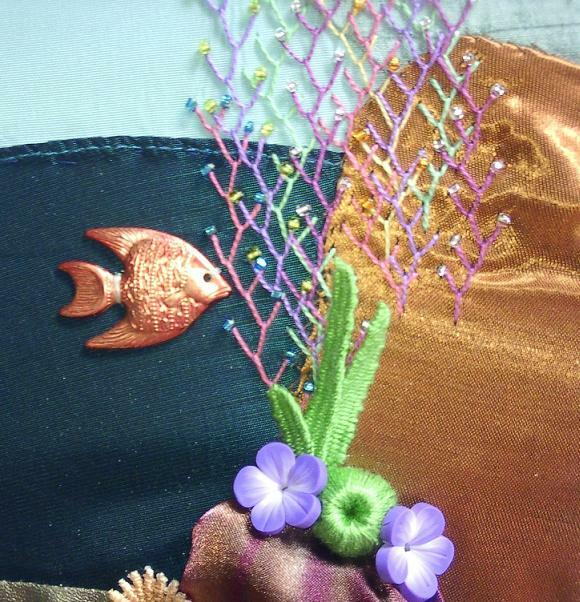 Then I added the "oranges" which are glass iridescent beads. The "ground cover" is tiny little flowers of lace that I detached from some yardage trim I had. 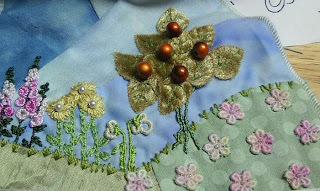 The last steps in completing Maureen's English Garden block is the beading...here is the finished block. 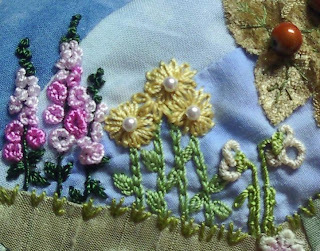 The bottom two rows were stitched with small filling stitches like the knotted blanket stitch...and tiny beads added for more texture. 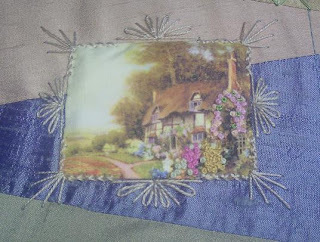 You might find it interesting to know that the finished size of this block is six-inches square, so the scale is smaller than a standard twelve-inch block would be. It's ready to mail out...but I'll hang on to it until the due date. The dreaded bullion! Many folks are convinced that these are just not something they can stitch. Nonsense...but there is an easy road and a hard road. The easy road means that you have all the right tools on hand to do the job right. The needle you use is designed for creating bullions and has an eye that is no wider than the needle shaft. That way, the loops of the bullion will slide off the end effortlessly...and not get "hung up" on the eye. 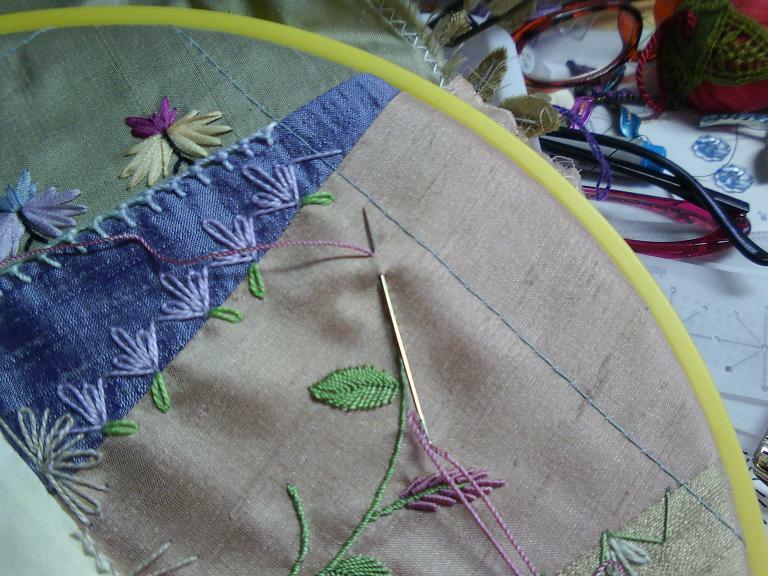 When working with six-strand floss...a straw needle or milliners needles does a perfect job! 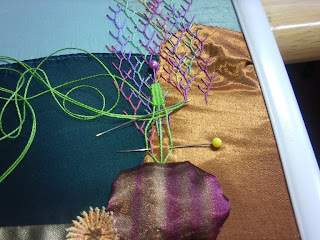 But, when working with larger threads...like perle...it is hard to find a straw or milliner needle that has a large enough eye for the perle...without the needle shaft being so big that it doesn't leave huge holes in the fabric. That's when you take the hard road...and deal with what you have. Still, bullions can be done...without a lot of headaches. So, since this is not a perfect world where I live...and I have to use the best tool I can find..the hard road it is! 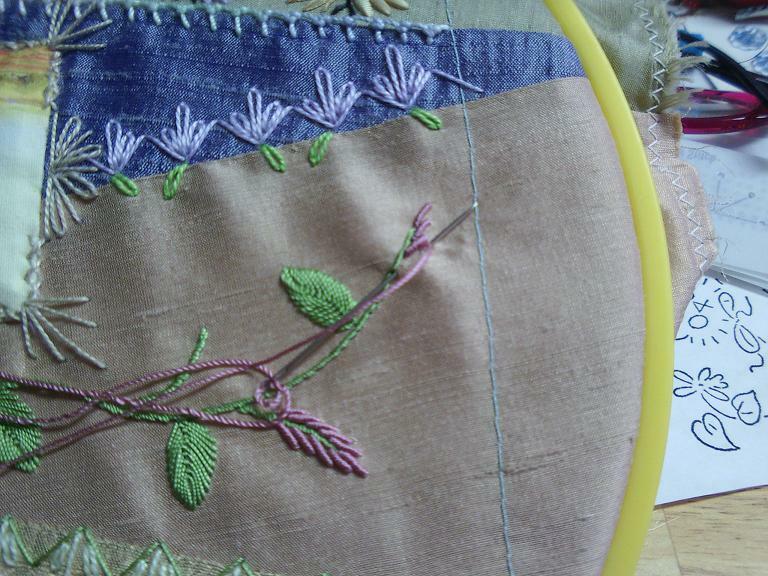 An embroidery or chenille needle with the smallest eye I can get the thread through is usually my choice. I squeeze the thread at the tip to get it into the smallest needle I can...and the needle eye is long and slender...and the width of the eye is close to the same width as the shaft...but not quite the same.So, here is how I manage. Needle up at the top of the bullion (or at least where you "want" the top to be)...and then, needle down at the bottom coming back up at the top again...without leaving the fabric. 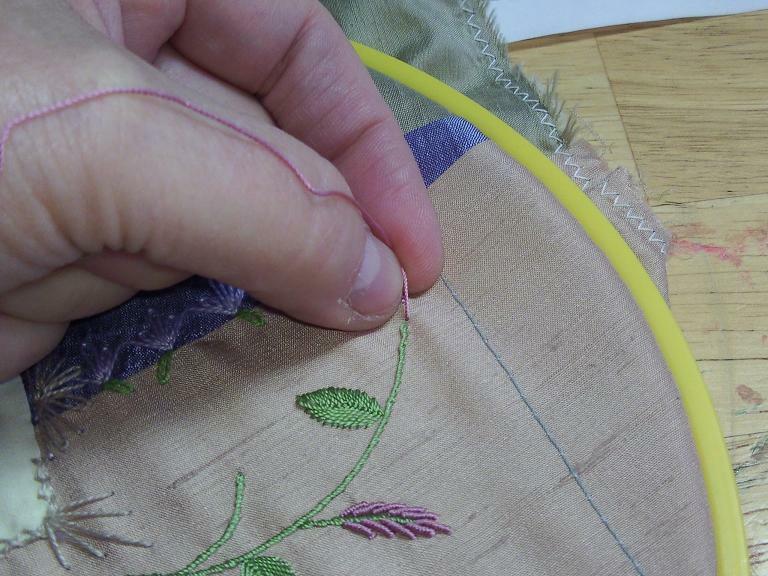 This stitch will determine the length of the finished bullion. 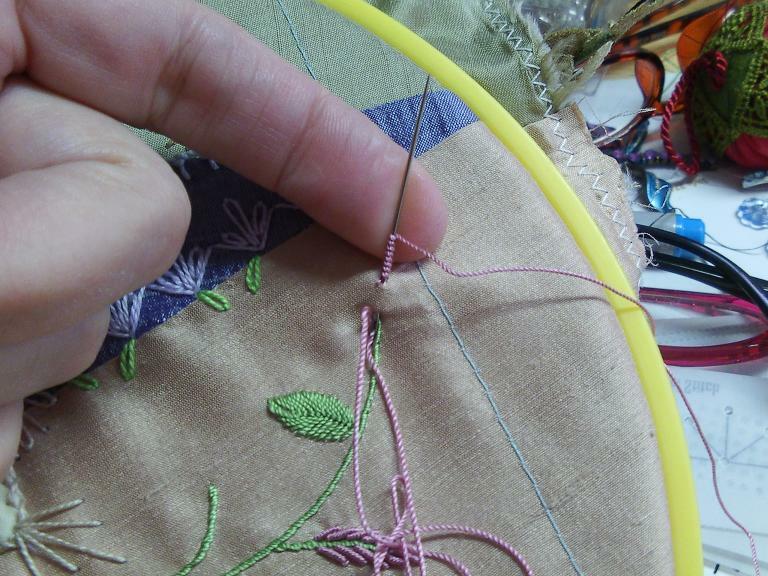 Then, I push my needle almost all of the way through the fabric, so I can get my left index finger under the needle (I am right handed). I start to wrap the thread clock-wise around the needle until the number of loops make a little stack on the needle...about the same height as the length of space between my "top" and "bottom" needle positions were. The wrapping is neat...and snug...but not tight. Now, I grab these loops in my left hand...between my thumb and index finger. 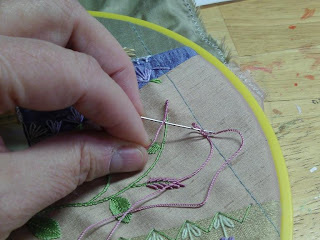 Grab the needle tip and pull the thread through...without letting go of the loops (you'll thank me for that later). Pull the thread until it starts to tighten under your fingers...(I had to put the needle down to get this photo). 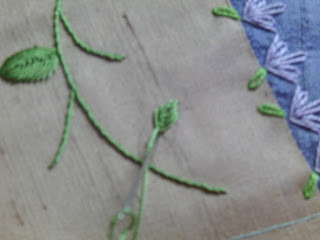 After I have pulled them as tight as I can from under the bottom...I move my needle to the top of my thread and push the loops some more to snug them as close together as they can go. 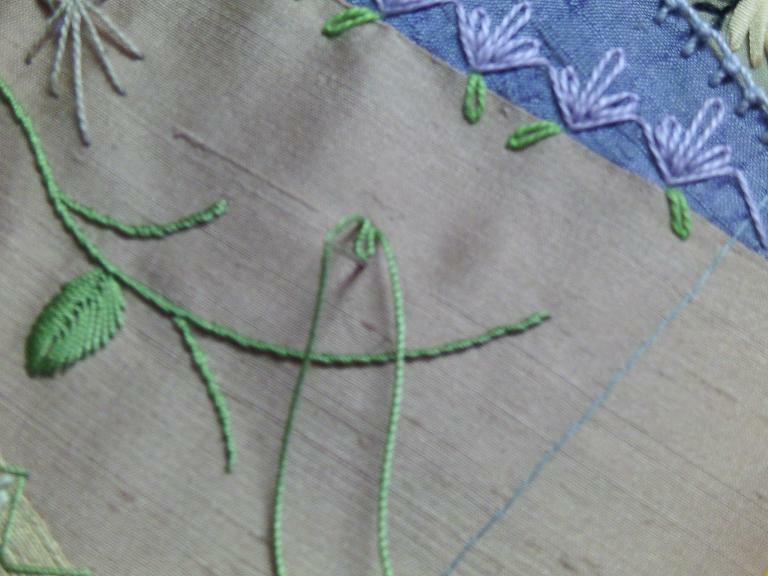 Lastly, I needle down at the bottom of the stitch. That completes one bullion. 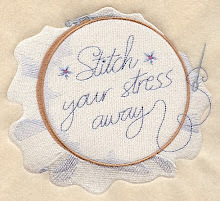 Repeat to stitch as many as you need. Remember that the direction and length of the bullion is set by the first steps...needle up at top...needle down at bottom, and back up at top without exiting the fabric. If you load more bullions than will neatly fit into this space...the bullion will curve. If you put too many in the space...it will have the center core thread showing out the bottom. For this flower, I stacked the bullions one next to the other...and started the next one at the half way point of the one on top. 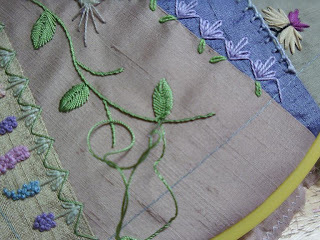 The first bullion is stitched at the end of the vine/stem...then the left side ones are done...then the right side ones. And here is how the leaves are done. 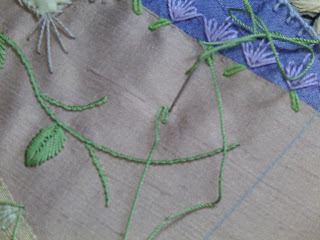 First, I like to start with a simple detached chain stitch (lazy daisy) starting at the tip of the leaf and working back about 1/4 to 1/3 of the length of the leaf. You can also see that I have drawn the general shape of the leaf with my pencil, this will keep me on track. Some folks put a pencil "dot" at the leaf tips and sides...but I find that the entire shape is what I need to create a nice shaped leaf. After completing the detached chain stitch, bring the needle up at the left side of the leaf...right next to the start of the detached chain stitch. 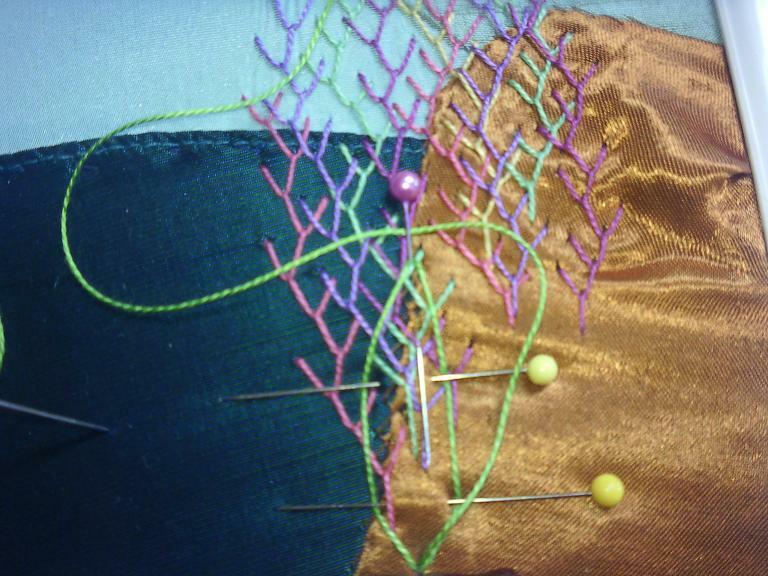 Now, from here on...we'll be stitching fly stitches. 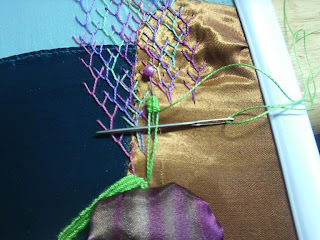 Fly stitches are really similiar to detached chain stitches...but instead of having the needle going up and down in the same starting spot...you have space between them. 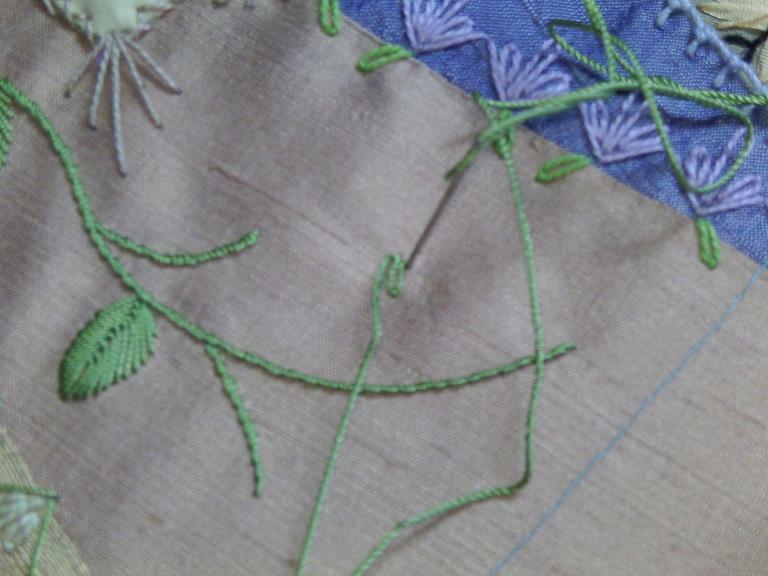 So here is the beginning...needle up at the left side of the detached chain. Needle down at the right side of the detached chain...staying close to the top...and on or just outside of the pencil line of the leaf shape. You don't want to see pencil lines when you have finished your leaf. 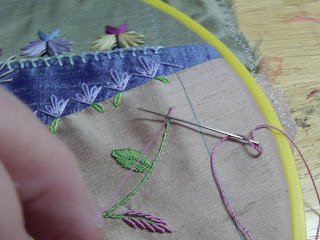 Start pulling your thread through and needle up at the bottom of the stitch...just like you would when completing a detached chain stitch. 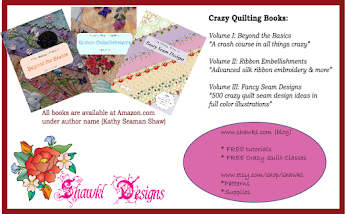 Get ready to anchor the stitch loop down. 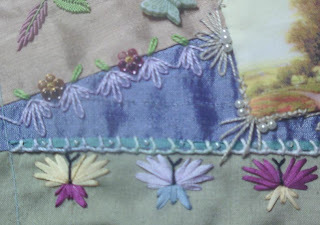 This next photo is a little blurry...but that is my needle at the bottom of the stitch...going back down into the fabric...just couching the last fly stitch in place. This will anchor the loop down...just as you do with a detached chain stitch. These little "anchors" will become the spine of the leaf. They can be right down the center...or curve them to the left or right to get more "bend" in the leaf. 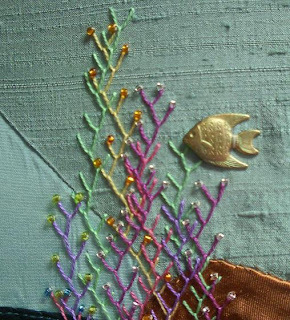 Once you have anchored the stitch...do the next one. 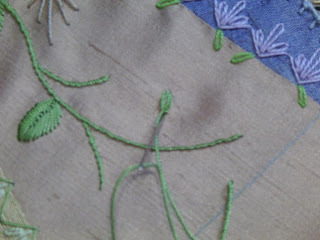 Needle up again on the left side...needle down on the right side (following the pencil line of the leaf shape)...and needle up at the bottom and down again while couching he thread in place. Keep going until the entire leaf shape is full. As you begin the leaf the stitches get wider and wider apart at the top...because the leaf is getting wider. Towards the halfway point of this specific leaf shape, the leaf starts to narrow and comes to a point at the bottom end. 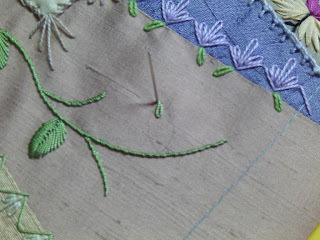 The flystitch is the same technique...the space between your needle up (left side) and needle down (right side) just differs depending on the shape of the leaf. Don't stress over it...just stay with the line. 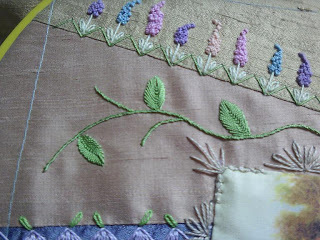 If need be...you can also add a single stitch at the bottom of the leaf to fill in any remaining space...or to make a stem. Now, wasn't that easy! Tomorrow, we'll stitch some flower heads on those stems! 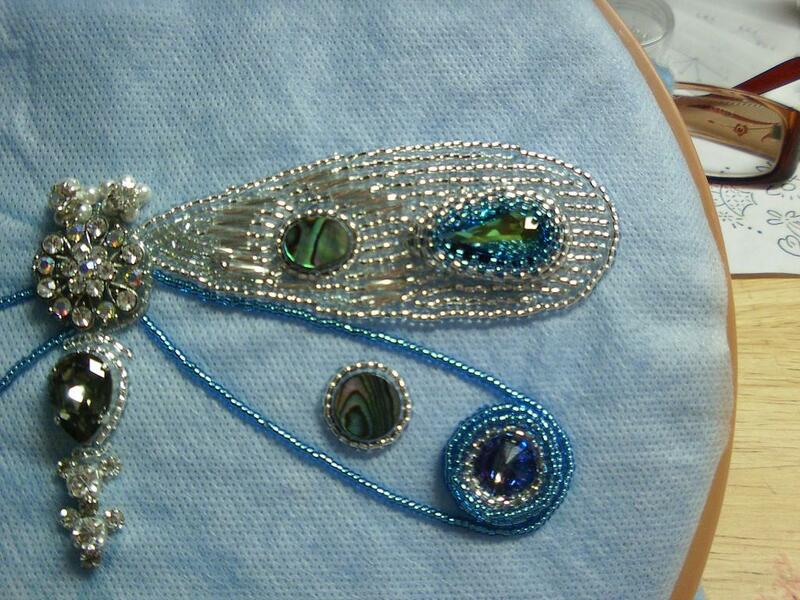 Here are some closeups...the only things added are the beads and charms. But, they finish off the stitching nicely I think...and make it look like a real scene. I can almost see those fish swimming! 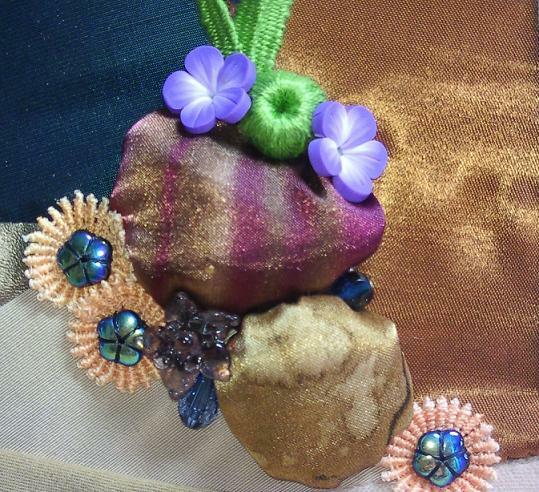 Here are the rocks...some clay roses are added to the green stump-work plant, and a purple glass one is added below. 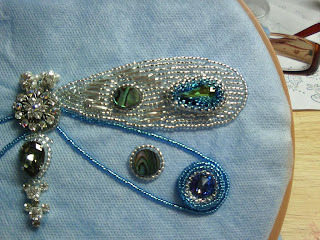 A couple of German glass beads in blue, and some flower iridescent type beads are added for more color. The fish are brass charms, and while I often ink these type of charms...this time, I painted them...with fingernail polish! The feather stitching has been adorned with multiple seed beads in three different colors. The Under The Sea block continues. 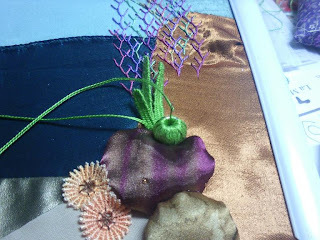 I wanted to add some more plant-life, and a woven detached plant will be first.The little round plant is a Pandora large hole bead that I'm wrapping in green Perle cotton. The woven tall plants are easy to create, but a little tedious. 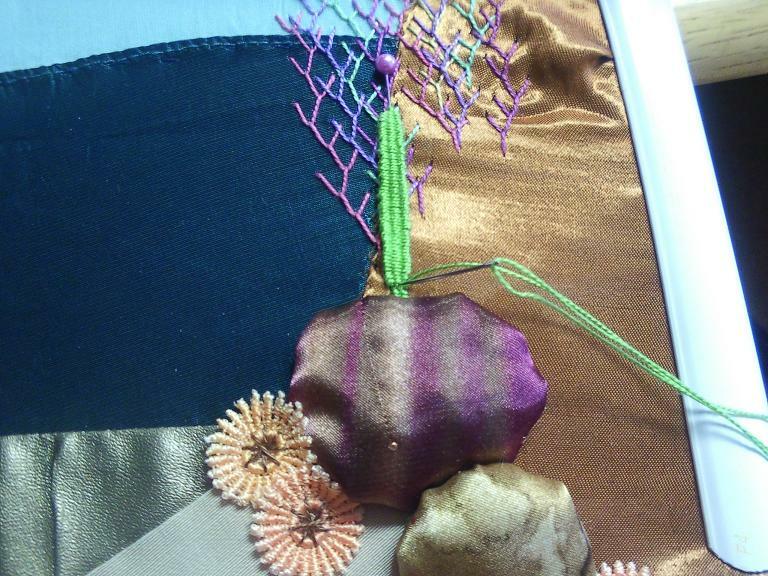 Here is how the tall plants were made: To help keep the plant the same width from top to almost bottom, I put two pins in the background fabric horizontally; and to set the height I put one pin in vertically. 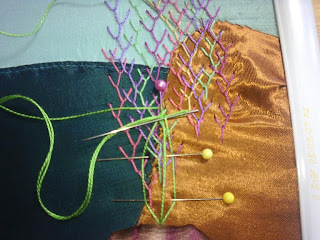 The base threads will be woven around these pins. First, needle up at the base of the plant. 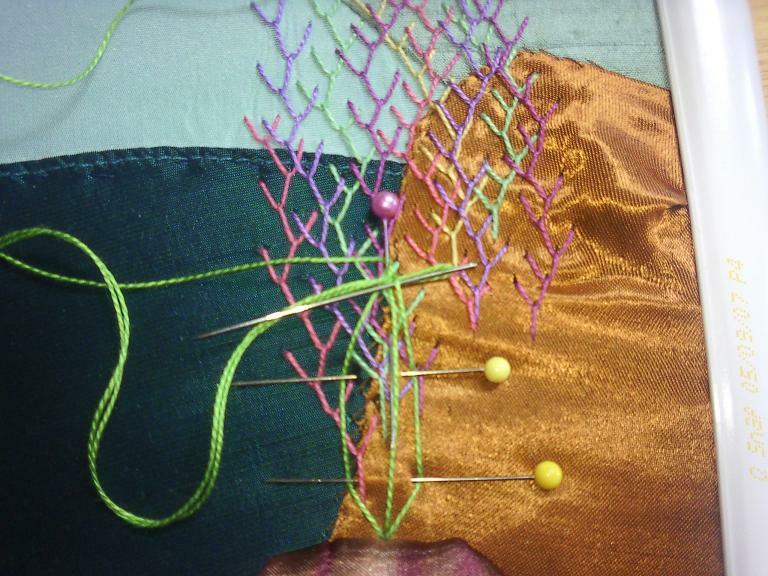 Bring the thread under the heads of the pins (right side), around the head of the vertical pin (top) and under the points of the pins (left side). Needle down back near the start point, but not in the same hole. 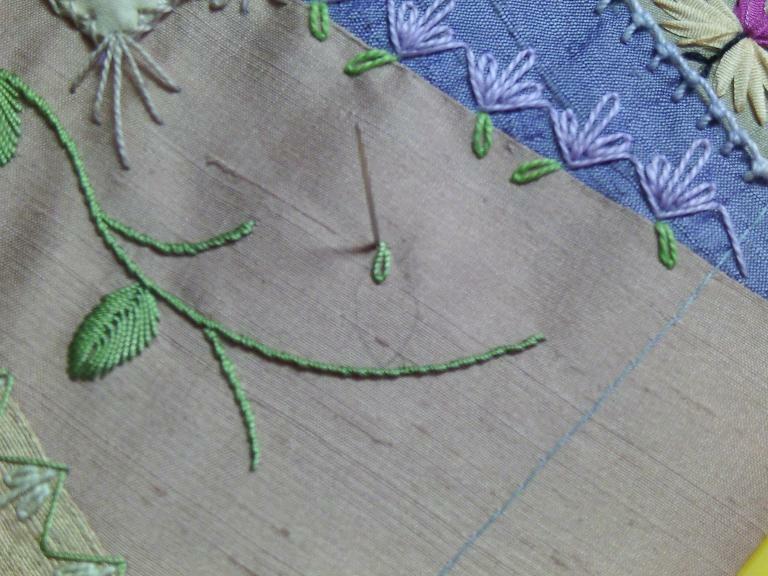 Needle up close to the start point, wrap thread behind the vertical pin. 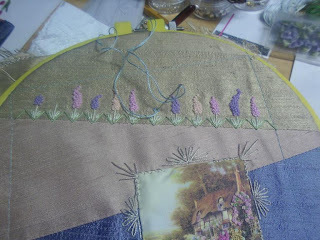 Next, change to a blunt tip tapestry needle (or use the eye of the needle you already have, as I have) and weave the end of the thread over the middle thread and under the right thread. This begins the weaving process. 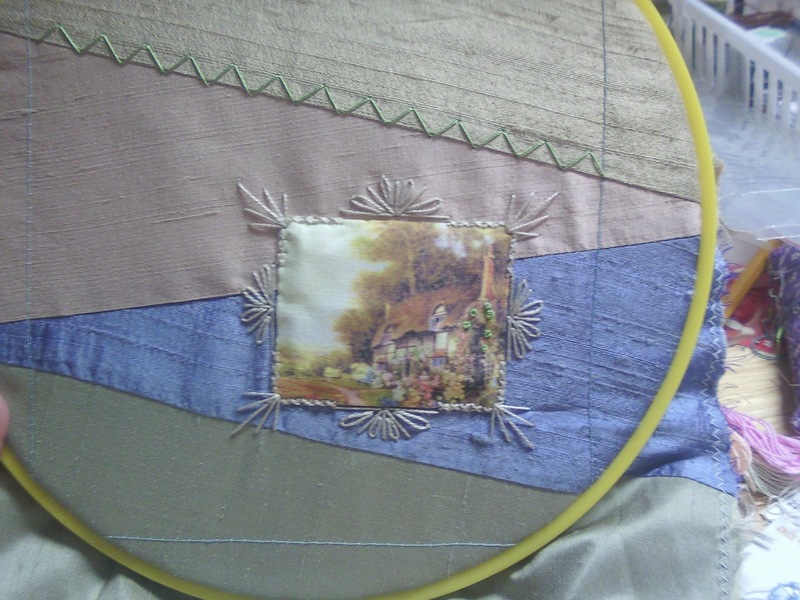 Go from side to side weaving the thread over and under as you would in making a basic weave. (If you go over a thread in row 3, then go under that thread in row 4, etc) Keep moving from left to right...then from right to left...weaving. Keep the thread loose. Slide the needle up toward the top to "srunch" the threads up tight. 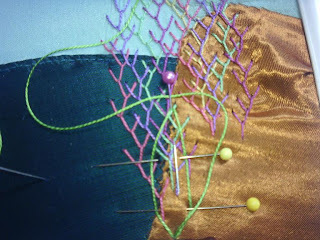 The plant shape will begin to form as you weave back and forth. 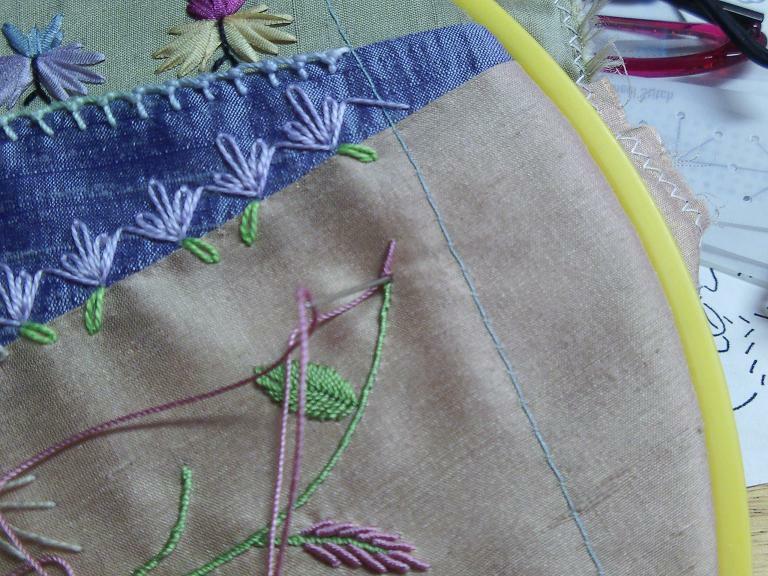 Keep the horizontal pens in until your weaving gets close then remove one at a time as the weave builds. Continue in this manner until you reach the bottom of the plant. Take a few tacking stitches to anchor the bottom securely and keep the weaves from shifting. Remove the vertical pin and you can see that the plant is detached and free standing except at the base. 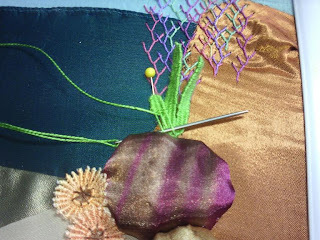 If you did not want the plant detached...a small stitch could have been taken at the top when you began the weaving process to anchor it. It is also possible to stitch the detached plant without the horizontal pins in place as guides...but the stitches have to be kept loose so as not to pull the threads to tightly and distort the shape of the plant. And, here is the last vertical plant...the last step was stitching down the Pandora bead. 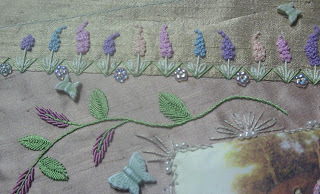 Hope you enjoyed this little tutorial...and will try this stumpwork technique on a project too. 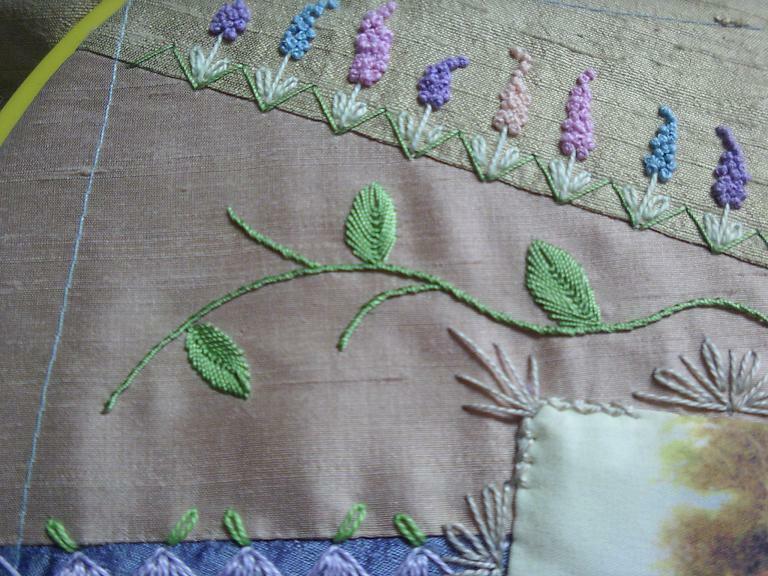 I've gotten a couple of seams completed on the current English Garden round robin block. Both are using the templates. The first is a zigzag seam of French Knot flowers...Stitch #12 in the book. Here is the seam, all done! Just perfect for an English Garden block I think. 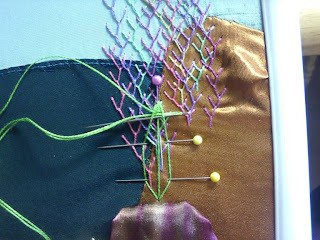 Now on to the next seam...and if you are still dragging your feet on using templates...let me show you how easy they are. 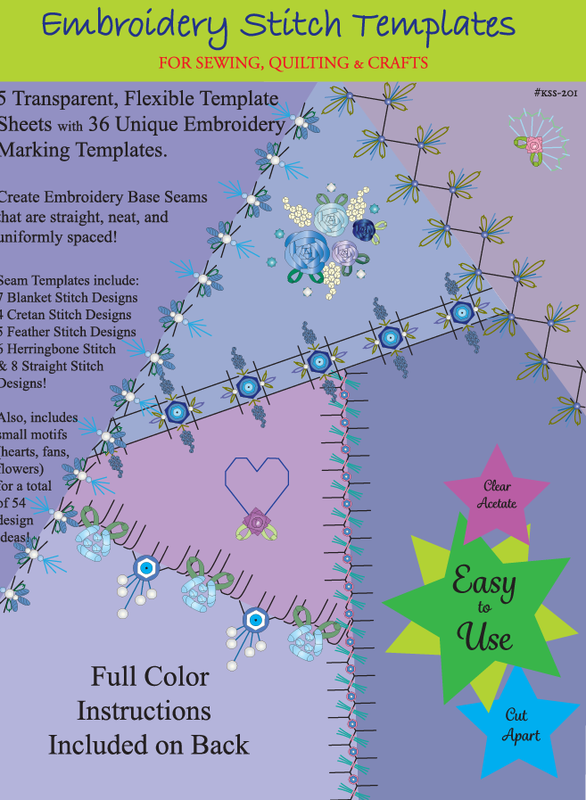 This next seam is butterflies...and is also included in the book's templates patterns. 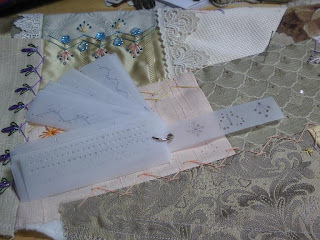 A reminder that first we print the templates, cut them apart, and punch out little holes...then, lay the chosen template where you want your stitches to be and mark a tiny pencil dot in each template hole. (It took me just about 2 hours to do cut and punch ALL of the templates, and you can see that I have them on a little "ring"...and I use them constantly...well worth the 2 hours it took to prepare them!). 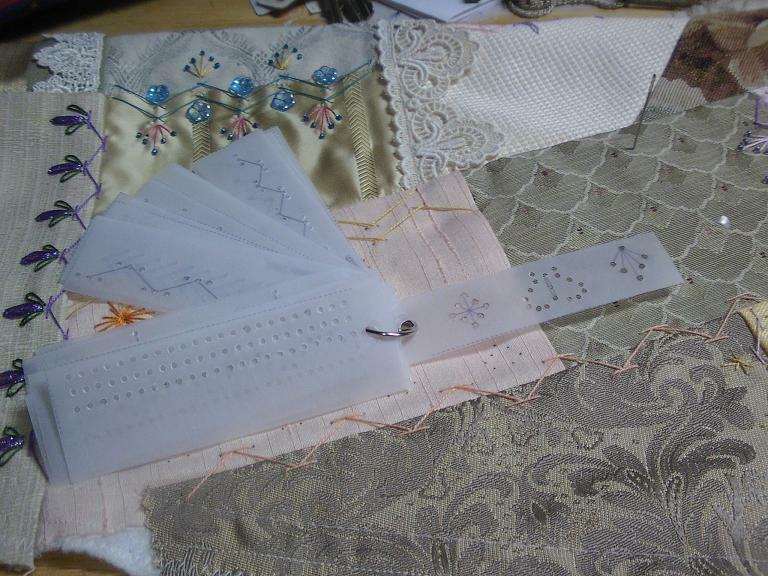 Then, when you move the template...your little dots can be used to guide your stitches. And lastly, stitch. 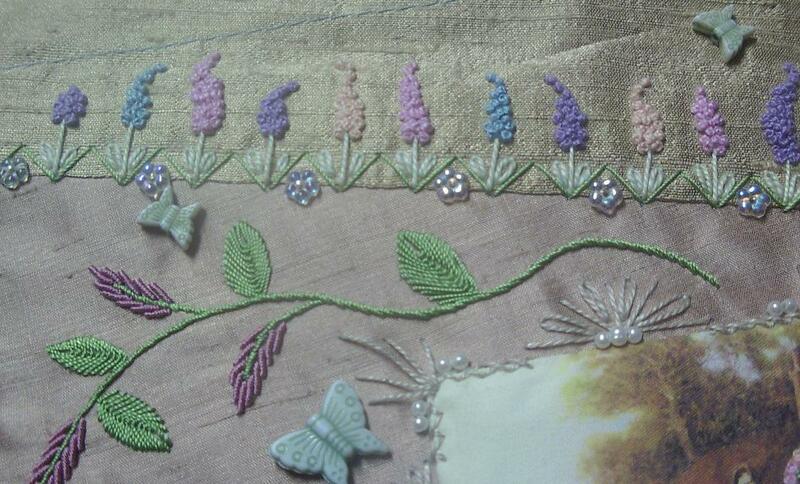 These butterflies are done in 3mm silk ribbon with black embroidery done in size 8 perle cotton...straight stitches. I have also added some French knots to the little silkie...it is so small, that much stitching would really overpower it...but, it needed some more texture...so this is it. 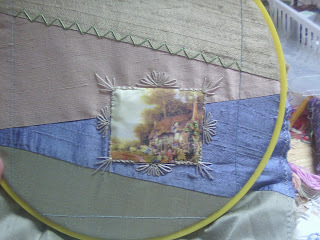 I still want to add to the border...but my muse has not decided what that addition will be yet! 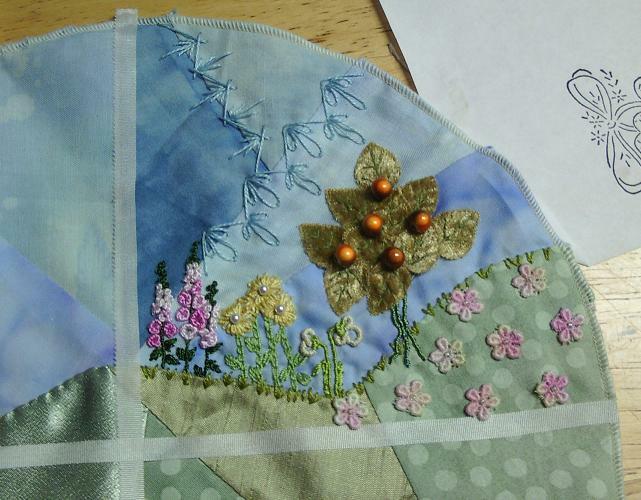 The English Garden round robin continues...and I have a new block to stitch on. 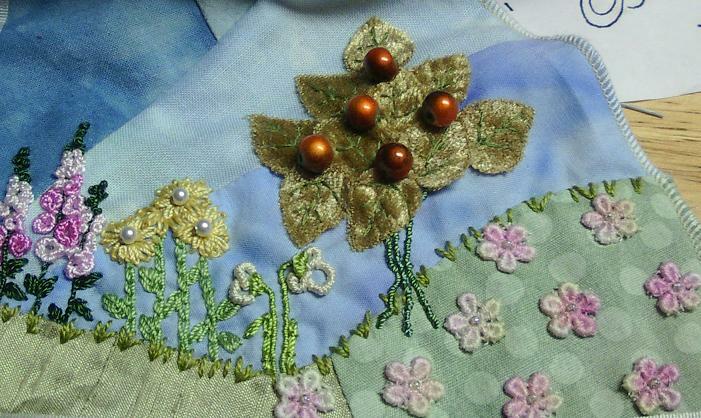 This round robin is a little unusual because everyone is not stitching on the same block. Instead, the creator pieced several small blocks...and each person in the rotation will complete one entire block instead of sharing a larger one.